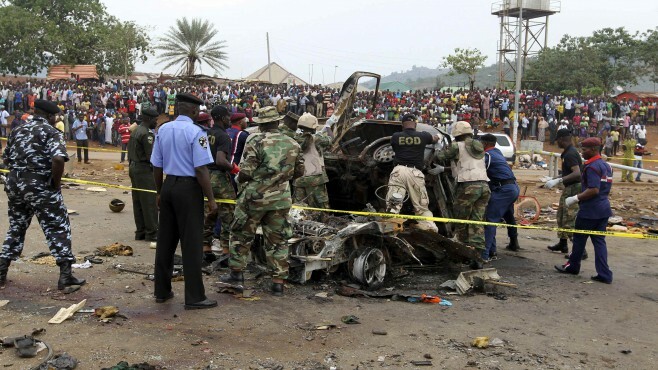 zJNN 25 July 2014 Abuja : More than 80 people have been killed in two separate bomb attacks in the Nigerian city of Kaduna, security sources say. The first attack that left 32 people dead took place on Wednesday when a cleric and his congregation were targeted on a busy commercial road, said police commissioner Shehu Umar. Sheik Dahiru Bauchi, who was giving an annual Ramadan speech, was targeted by the blast. He is said to have survived the attack. “The attack was targeted at the sheikh. No arrest has been made yet,” the police commissioner noted. Shortly after the first explosion, a second bomb blast killed 50 people in a crowded local market named Kawo. The target of the second attack was reportedly opposition leader Muhammadu Buhari who also escaped unhurt. “This blast, coming in the holy month of Ramadan, is a clear indication that those behind the act have no iota of fear of God,” Kaduna state governor, Mukhtar Ramalan Yero, said in a statement. No group has yet claimed responsibility for the violence, but this comes in light of growing militancy in Nigeria by the Boko Haram Takfiri militants. The notorious group has repeatedly targeted civilians, mostly in the remote northeastern state of Borno, killing more than 2,000 civilians since January. On April 14, Boko Haram kidnapped 276 students from their secondary school in the town of Chibok in Borno. Reports say 57 of the girls managed to escape, but 219 are still missing and international efforts to spot and rescue them have failed so far. Boko Haram — whose name means “Western education is forbidden” — says its goal is to overthrow the Nigerian government. It has claimed responsibility for a number of deadly gun and bomb attacks in various parts of Nigeria since the beginning of its militancy in 2009. This entry was posted in AFRICA and tagged Boko Haram, Dahiru Bauchi, Muhammadu Buhari, Mukhtar Ramalan Yero, Nigeria, police commissioner, Shehu Umar.. Bookmark the permalink.